Lebanon does not have formal refugee camps for those fleeing the conflict in Syria. Many Syrian refugees do not have the money to rent an apartment, and living in an informal tented settlement is the only option for the most vulnerable and impoverished households. Rajab is an informal tented settlement in Lebanon in the Western part of the Bekaa valley. The settlement is comprised of 360 tents and hosts 1,700 individuals, of which 70% are children and women. Families in Rajab settlement live in tents covered with plastic, cardboard and old rugs and access to basic services—such as food, sanitation, health, and education—is not officially established in settlements and can be intermittent. 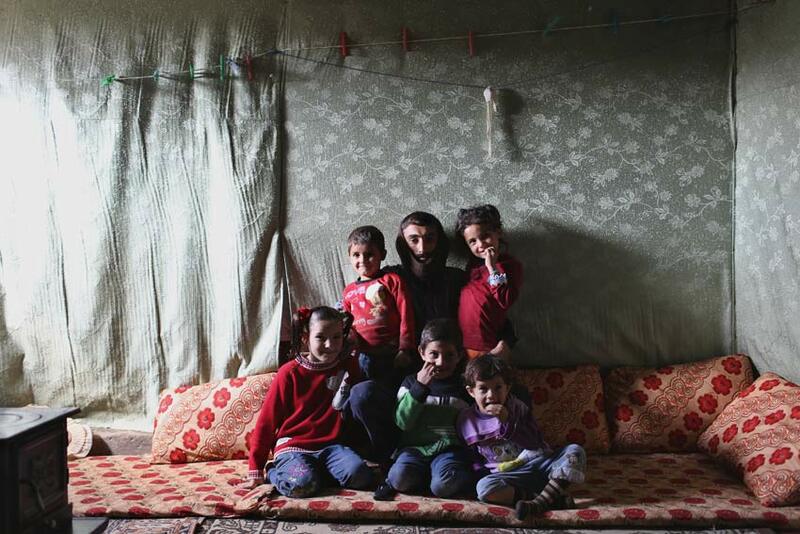 Residents of Rajab informal tented settlement are from the poorest socio-economic strata of Syrian society. Women have a low level of education and men are unskilled workers with low level of education as well. This severely limits employment opportunities in Lebanon, and most people only occasionally work in daily unskilled or agriculture labor. Families are almost all dependent on ad-hoc cash and humanitarian assistance. Flooding is a significant problem, and winter’s freezing temperatures only compound the difficulties for those living in the settlement. The dire conditions and the lack of adequate access to the most basic necessities—including clean water, soap and sanitation—have led to many cases of diarrhea, fever, skin and respiratory diseases. International Medical Corps provides medical consultations in Rajab settlement at Rafic Hariri clinic, which serves approximately 55 individuals every day. In addition, Al Makassed mobile medical unit operates every Tuesday in front of Rajab settlement. The mobile clinic began operating in mid-September 2014, and treats approximately 40 patients each week. International Medical Corps ensures that the Rajab community receives holistic health care by integrating mental health into the primary healthcare setting. A mental health social worker accompanies the doctor and nurse in the mobile medical unit every Tuesday and conducts awareness sessions on mental health, particularly depression and psychosomatic disorder, to 20 women and men living in the Rajab informal tented settlement. ‘‘This is a very helpful tool because we are experiencing trauma here and it is a collective suffering that we all share during the sessions,’’ said Ibrahim, who prefers to remain anonymous. International Medical Corps’ health education team, comprised of one community health educator and two community health workers, visits the Rajab settlement biweekly to assess the needs of refugees and identify emerging issues. During their visits, the community health workers conduct health education sessions to help prevent and identify health issues such as diarrhea, lice, scabies, leishmaniasis, hepatitis A, and tuberculosis. The health workers also raise awareness of the importance of good hygiene practices and proper food safety, proper pre-natal care and childhood vaccinations, among other issues. International Medical Corps’ health education team distributes hygiene kits containing soap, shampoo, toothpaste, toothbrushes, and other basic necessities. Feminine kits, which include feminine hygiene products, are provided to women, and newborn kits are provided to families with infants. In addition, medication to treat lice and scabies are distributed as needed. During the last two months, the health education team has identified seven cases of diarrhea and 20 cases of feminine infection, all of which were referred to Hariri clinic for treatment. Referrals have also included 25 pregnant women for sonograms. The programs provided in Rajab informal tented settlement are just one example of our work in Lebanon. International Medical Corps assists Lebanon with managing the needs of over 1 million Syrian refugees who seek protection from violence and insecurity in their own countries. Through our nine mobile medical units and support to 45 health facilities throughout the country, we provide primary health care, health education, mental health, and psychosocial services to refugees, as well as the local population hosting refugees.